We provide screenprinting and embroidery services for clients of all sizes. If you have a small run of 20 tees or a larger run of 2000+ tees, we’re here to help! Our team are dedicated to printing and legitimately love their work, we take pride in each and every job and our main aim is to translate what’s in your head out into the world. If you’re starting a brand, printing your annual conference tees, a school looking for new uniforms, printing some promotional tees for a special event, or a large corporation needing some competitive local production we can cater to your needs. We don’t just screenprint on t-shirts, we also screenprint on Totes, Cushions, Pillow cases, Tea towels, Hats as well as High Vis Workwear. If there is something specific that you require don’t hesitate to contact us. Head over to our ‘Apparel’ section to view all of our preferred suppliers. Minimum print run is 20 units per design. This can be mixed up into tees, singlets, hoods etc. as long as the design is the same across all the products. Anything under 20 units (6-19) is charged as under minimum, which is double the price per print. Sampling is 1-5 units per design and is charged at an hourly rate of $50+GST (with a minimum of 1 hour) plus the setup costs. Our regular turnaround time is 2-3 weeks from receiving payment and approval of your job sheet. If you want to book in a job and pick it up under this time, a 25% rush fee is applied to guarantee the jobs completion by the due date. If you’re unsure whether or not your job falls under the regular turnaround time, send through an email and we can discuss your needs. It’s always better to let us know if you are working with a deadline. Plastisol is the ink of choice for most designs we print. It is an extremely versatile ink and can be used on most textiles including t-shirts, fabric, hoodies, jackets, totes etc. It wears very well, allows for bright & bold colours (including fluoros), easy to match to the Pantone Solid Coated System and creates great opaque whites on dark fabrics. It is the ideal ink choice if you want a bold, vibrant and colourful print finish. 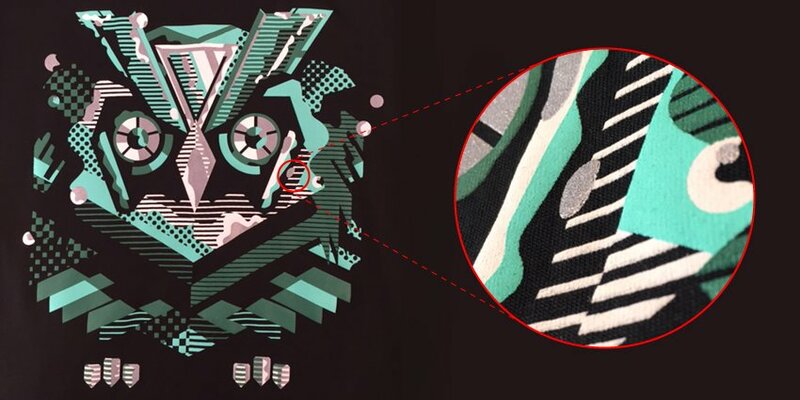 Discharge ink is a solvent free ink that soaks into a shirt’s fabric. However unlike water based ink, the discharge additive reacts under heat to remove or ‘strip’ out the fabric dye colour to expose the original un-dyed fabric, leaving a calico like colour. To add colour we mix the discharge agent into our ink to re-dye the print area once the discharge agent has removed the fabric colour. Discharge printing is perfect for creating soft prints, however it does have some limitations. We cannot guarantee a completely consistent result since we are relying on the dye batch of the garment. There are many factors that can affect the outcome of discharge inks and if you want to go ahead with it you should be aware that there may be inconsistencies in coverage and/or colour of your design. This uniqueness of the print can be a benefit if you design your print with this in mind. Waterbased printing is very similar to discharge printing but for white and light coloured shirts. The inks are dyed into the fabric, instead of sitting on top of the fabric like our standard plastisol inks. When used on dark colour fabrics it gives a strong faded/vintage look. Keep in mind that when using light ink colours on dark shirts the ink colours will be tinted by the shirt colour. For example white inks on a black shirt will cause the inks to be a light grey. Waterbase and Discharge inks don’t have a rubbery feel that plastisol inks have, instead they create a soft undetectable hand feel. Waterbase and Discharge options are the ideal ink choice if you’re after a softer print finish. Do keep in mind that these inks are much harder to match to colour match, they can be different once printed so if the pantone colour is a priority for you than plastisol inks may be the way to go. Process printing involves separating your design so that it can be printed in a way that best replicates your artwork. Depending on the design/photo there are various ways to print these kind of designs, from as little as 1 colour up to 10 colours. Process printing works best on white or light coloured garments, though we can print onto darker fabrics using a simulated process method. When printing the simulation process method on Black, a white base is needed which will add an extra colour to the design. It is important to note that while the print will still be vibrant and highly detailed, some elements of detail from your original digital file will be slightly lost when printing the design. Vinyl Transfers involves heat pressing vinyl cut designs onto a garment. Vinyl transfers are perfect if you are looking for individual team member names and numbers on your printed shirts, as well as promotional garments, hats, double lined jackets and sport and performance wear. Keep in mind that vinyl transfers don’t have the long life expectancy as a regular screen print and we cannot colour match to specific Pantone numbers since we are limited by the vinyl available. If you are supplying your own design, artwork must be supplied in a Vector File .pdf .ai .eps. We cannot use bitmap, jpeg or photoshop files. If you have any questions regarding vinyl transferring your garments, send us an email, our team will be happy to help you out. Screen print transfers are a premium alternative to vinyl transfers, it involves screen printing your design onto a transfer sheet which is then heat pressed onto the garment. Screen print transfers are used where screen printing straight onto your garment is not possible. Screen print transfers are used for inside neck printing on fleece, and are ideal for hats, double lined jackets and sport and performance garments. Foil is a great option to really make your shirts pop. Sheets of foil are heat pressed on top of plastisol inks. We can also mix foil with standard printing but waterbase inks must be used for the other colours being used. Keep in mind that foil does not last as long as screen printing. To extend the life of the foil please wash these garments inside out in cold water then hang dry. 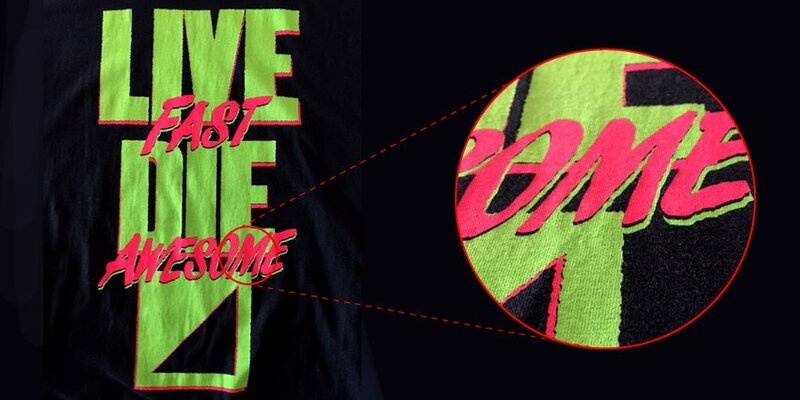 We print a similar colour of ink under the foil to help make the shirts last longer when they do start to peel. If you are still looking for something a little different we also offer a wide range of inks that glow in the dark, reflect, puff or shine. We can print your shirts with metallic inks, glitter, puff ink, UV reactive ink, fluorescent inks and more. If any of these are what you’re interested in, send us an email for more information about these ink types and their printing finishes/limitations. We offer the service to have the manufacturer’s sewn in tag of the garment removed and replaced with your own custom tags or a printed one colour design on the inside of the neck. Keep in mind that certain garments take inside necks better than others. For example, in order to print an inside neck label onto fleece it will need to be done as a screen print transfer. We recommend using a light grey ink (Cool Grey 10U) when printing inside neck labels to help prevent the print showing through the back. By law all printed tags are required to list Country of Origin and Fabric. If you are printing on multiple brands and fabrics, additional tag files will be needed. We can fold and bag your shirtsinto individual plastic sleeves for a professional touch. This helps keeps your shirts organized and clean. Minimum order for these is 100 units. We keep all customer artworks on file, so if you wish to do a reprint of a previous job you have done with us, all your setup costs for your new job are waived. Keep in mind the design of your reprint must be exactly the same as your previous job. For example, changing the size of the same design is considered a new design and requires a new setup. 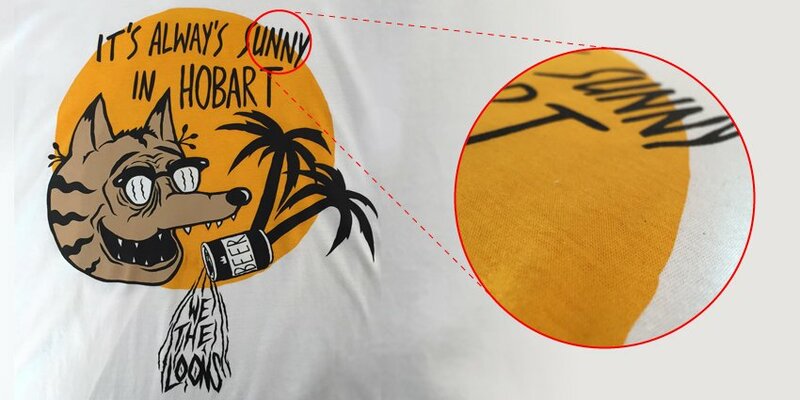 Also, if you originally printed onto white garments and wish to do a reprint onto black garments, you may have to pay for a new screen setup to include a white base. Our minimum order quantities still apply to reprinted jobs. If you want to print at home for a small project, we offer screen exposures so that you can bring in your screens and designs, then let us do the prep and hard work so that you can focus on the fun part of printing! All prices include film work, exposure time and prepping the screen ready for print. Please note that if you are supplying us with a used screen, strip it of all it’s tape and do your best to clean any ink so that we can speed up the process. If your screen is really old and in a bad way it may take us longer and end up costing you more. We don’t reclaim or expose screens if we don’t know the base metal as it can cause problems for our screen cleaning solution. Things to consider when buying a screen. Screens come in varying Mesh sizes to allow for different kind of artworks. If you aren’t sure about what mesh you need for your job shoot us an email. If you don’t have a screen of your own we can supply one for you. These are industry standard screens so you will get the best results. For any artwork or design needs our in-house graphic designer can work with you to achieve the best screen printing outcome you need. Whether it’s logo design, print designs, or artwork separations we’ve got you covered. Design hours are charged at $40 + GST/Hour (with a minimum of 1 hour). Preparing artwork for printing is not considered design work and is covered in your set up costs.